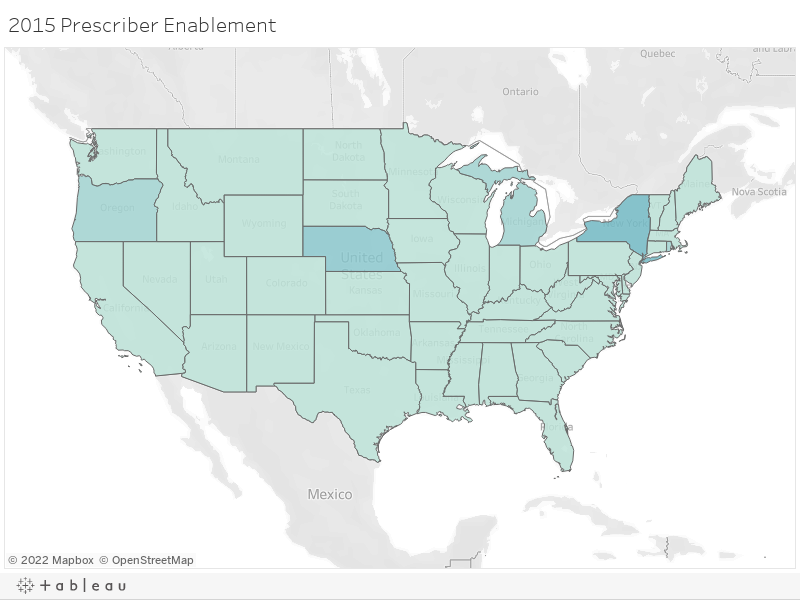 e-Prescribing of Controlled Substances – How Does Your State Measure Up? Navigating the waters of e-Prescribing can seem like a very daunting task considering the various state and federal regulations. To assist you in understanding, let’s review the information relative to e-Prescribing of Controlled Substances (EPCS) in all 50 states and how your state is measuring up. Until recently, one-half of all U.S. States prohibited e-Prescribing of controlled substances. The thought was that paper prescriptions were safer and more secure. On September 15, 2015, however, Vermont became the last state to allow electronic prescribing of controlled substances, or Schedule II-V medications, making this process legal in all 50 U.S. states. “We certainly believe that because of the enhanced security associated with e-Prescribing of controlled substances, the opportunity for abuse, misuse, and fraudulent activity is going to be dramatically reduced,” said Ken Whittemore, BSPharm, MBA, Senior Vice President of Professional and Regulatory Affairs at Surescripts™, a nationwide health information network. With this process now legal in all 50 states, and the safer option at that, it may be surprising to find that as of the most recent data available, only 7% of prescribers are sending controlled substances on the Surescripts network. So, why the discrepancy? Are pharmacies not accepting electronic prescriptions? Are prescribers not able, or willing, to send these prescriptions electronically? Is this process too difficult? Why is this process used in some states so heavily, but so infrequently in others? In 2010, the DEA published a final ruling giving not only practitioners the option to write controlled substances electronically, but also for pharmacies to receive, dispense, and archive electronic prescriptions. “It became incumbent upon a number of stakeholder groups in the pharmacy industry to tackle the issue and bring states into alignment with the DEA’s rule,” Ken Whittemore, BSPharm, MBA told Pharmacy Today. Many pharmacy stakeholder groups, including APhA, the National Alliance of State Pharmacy Associations (NASPA), the National Association of Chain Drug Stores, and Surescripts, worked together over a 5-year period to rework some state laws, a process that can take a long time. Between 2010 and 2015, the pharmacy end of the spectrum worked hard on adoption and enablement, while prescriber enablement trailed. Using data from Surescripts, a study published in the January 2015 American Journal of Managed Care found that pharmacies with technology in place to accept e-Prescriptions for controlled substances increased from 13% in 2012 to 30% in 2013. By contrast, only 1% of all prescribers were capable of e-Prescribing controlled substances in 2013. However, between 2012 and 2013, the number of e-Prescriptions for controlled substances grew dramatically from 1,535 to 52,423. Talk about a rapid jump! According to the 2015 Surescripts National Progress Report, an average of 81% of pharmacies were enabled for EPCS in 2015. 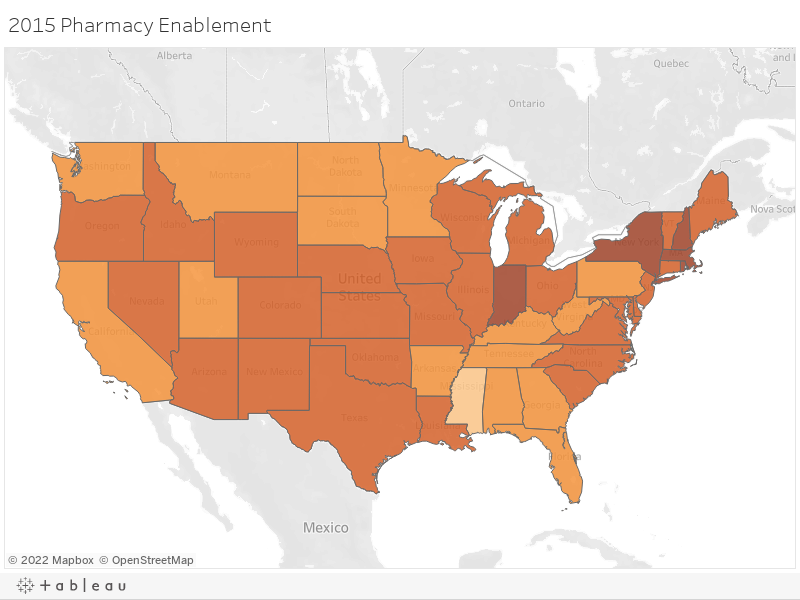 States including Hawaii and Mississippi were at the bottom of this list with less than 70% of pharmacies enabled, while states in the Northeast such as Massachusetts, New York, New Hampshire, and Rhode Island led this list with over 90% of pharmacies enabled for EPCS. As of December 1, 2016, these numbers have only risen, with both Hawaii and Mississippi now having over 75% of pharmacies enabled. New York and Maine lead the race on that front with 96.8% and 95.2% of pharmacies enabled currently. This is in large part due to the state mandates put into place in 2016 and 2017, respectfully. With so many pharmacies enabled for EPCS, and legislature allowing this process in all 50 states, it may be surprising to know that an average of 3.39% of prescribers were enabled to e-Prescribe controlled substances according to the 2015 Surescripts National Progress Report. Lengthy and time-consuming software auditing and prescriber identity proofing processes are likely factors that have stalled prescriber adoption of EPCS, but for pharmacists, the initial setup is much easier. In addition, there have not been enough incentive for prescribers to adopt EPCS. e-Prescribing was a requirement under the federal Meaningful Use Electronic Health Record (EHR) program, which incentivizes the use of EHRs through financial payments. However, e-Prescribing of controlled substances was specifically exempted from Meaningful Use Stages 1, 2, and 3. For these reasons, it isn’t surprising that in 2015 the state with the highest number of prescribers enabled was New York, as that was one of the only states with an e-Prescribing state mandate in effect at that time. In 2015, New York had 26.6% of their prescribers enabled for EPCS, with Nebraska not far behind at 15%. 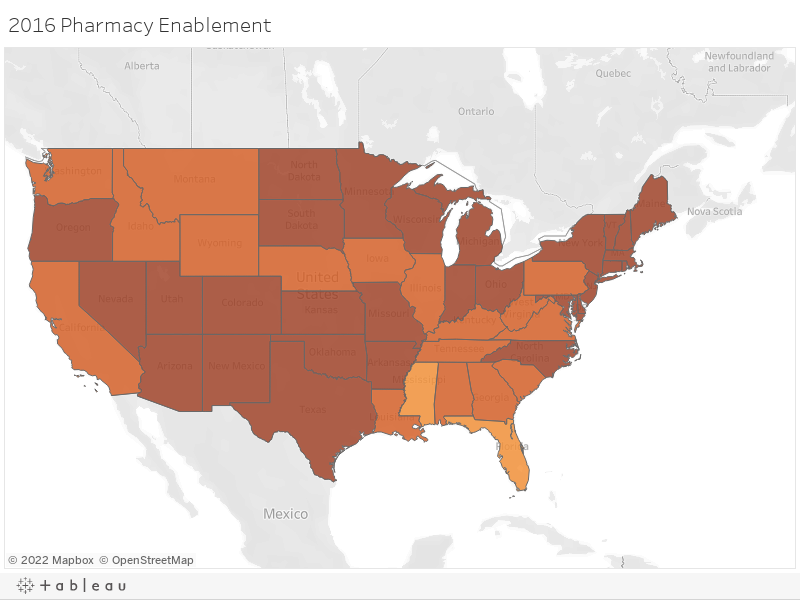 Fast forward to December 1, 2016 and prescriber enablement has grown tremendously in some states, but remain dismally low in others. 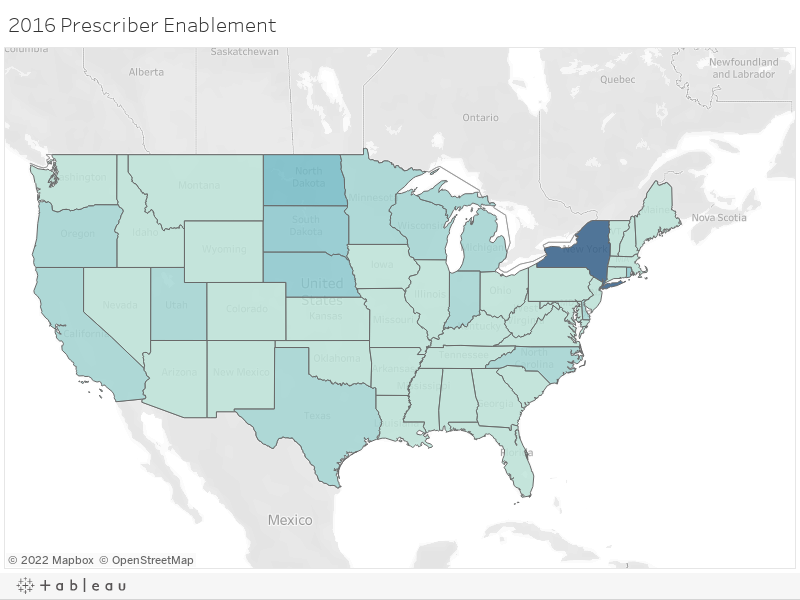 New York now has 71.5% of prescribers enabled, with no other state having even one-third of their prescribers enabled for EPCS. In fact, the average percentage for EPCS enabled prescribers remains even as of December 1, 2016, at only 8.4% despite all of the benefits of EPCS. Why are these numbers so varied? Electronic prescribing of controlled substances (EPCS) reduces fraud and keeps patients from getting multiple prescriptions for the same drug, so why are some states seeing major buy-in while other states are lagging? Much of this is impacted by states that have legislation in place to either require or reinforce the use of e-Prescribing, as outlined below. As you may already know, New York was the first state to require e-Prescribing of all prescriptions, both controlled and non-controlled, and the first to implement penalties for failing to adhere to this ruling. Penalties include, but are not limited to, loss of license, civil penalties, and/or criminal charges. With the highest rate of prescriber EPCS enablement, it’s evident that New York prescribers are taking this quite seriously. Maine is the next state to implement an e-Prescribing regulation as of July 1, 2017 where all opioids prescriptions must be sent electronically. With only 0.6% of prescribers enabled for EPCS in the state according to the Surescripts report, and up to 2.9% as of the beginning of December 2016, it’s clear that Maine has a long way to go for all prescribers to be ready to follow this regulation. Although it’s legal in all 50 states, and there are many reasons EPCS is safer than on paper or another method, there is still a great discrepancy between EPCS enabled pharmacies and EPCS enabled prescribers due in part to the strict requirements put in place on the prescribers. While the statistics referenced here show that provider adoption of EPCS is still low in comparison to the pharmacy adoption we have seen, it’s important to remember that the e-Prescribing of non-controlled substances also took years to reach the level we now see today. It seems the only tried and true way for these numbers to rise quickly and meet the numbers we currently see for pharmacy enablement is to implement regulations and penalties for not adhering to this requirement as outlined in the above state mandates. All eyes are now on Maine to see how their journey goes. Check out the maps below to see how your state measures up! DoseSpot is a Surescripts certified e-Prescribing platform specifically designed to integrate with electronic health record, electronic dental record, practice management, and telehealth software. DoseSpot is certified to e-Prescribe controlled substances and has provided simple, affordable and integratable e-Prescribing to more than 150 health care software companies since 2009. For more information, please visit www.DoseSpot.com. Maine is well known for its rocky coastline, iconic lighthouses, sandy beaches, and lobster shacks. However, past the classic scenery is where you’ll find the state dealing with a crisis that others across the United States are also experiencing: the opioid epidemic. 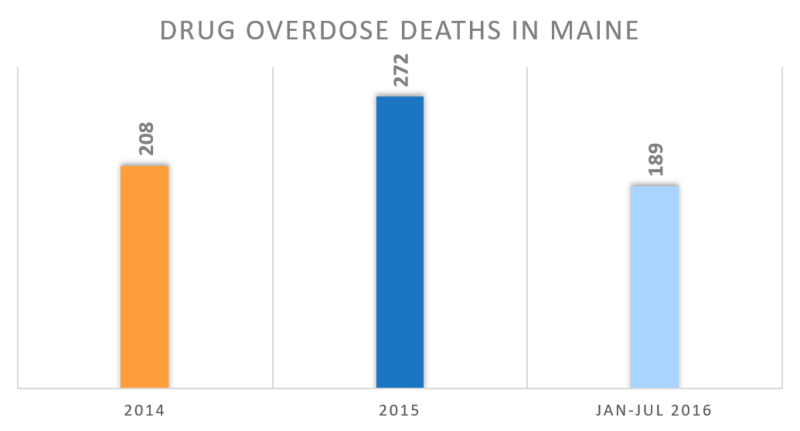 In 2015, Maine suffered an astounding 272 drug overdose deaths, following 208 deaths of the same cause in 2014. Sadly, there is no end in sight. 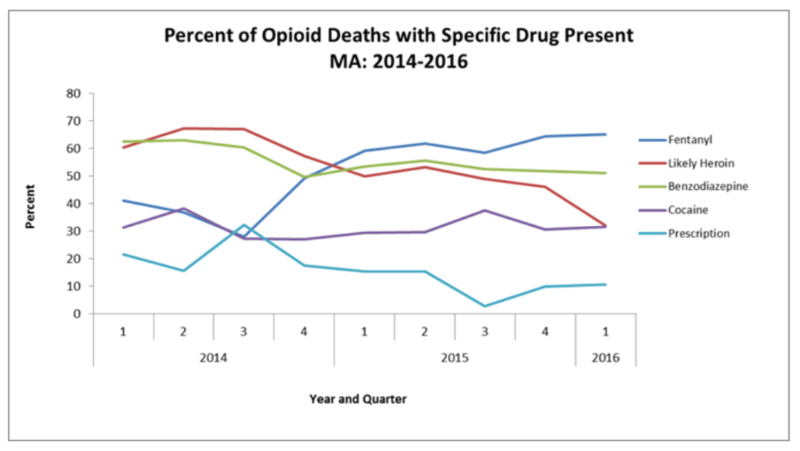 Maine’s Attorney General Janet Mills declared that drug overdose deaths are up 50% in 2016, with the first 6 months of the year experiencing 189 drug overdose deaths alone. What’s worse, the number of overdose-related deaths in 2016 is expected to reach a new record, surpassing those numbers of 2014 and 2015. 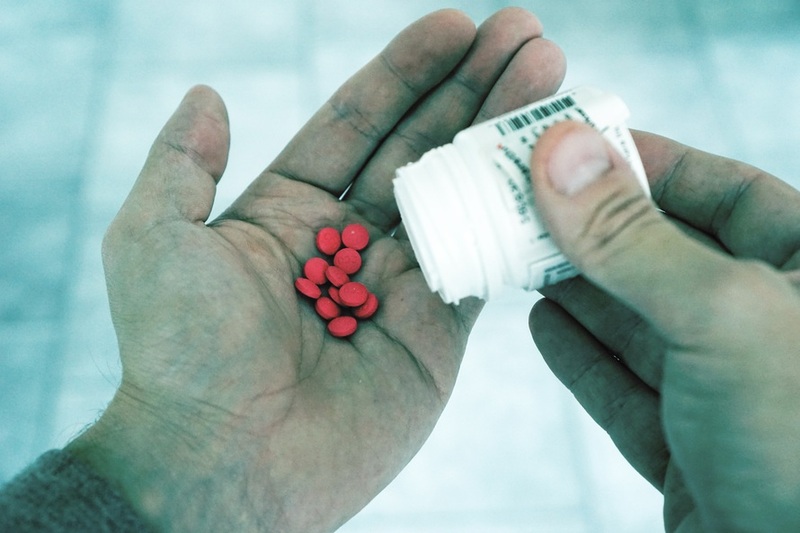 As a state with the largest number of patients per capita on prescription for long-acting opioids, the news that prescribed pain medication is further fueling opioid addiction is unsettling. This is why Maine has decided to take action. Maine’s new statue, “An Act to Prevent Opiate Abuse by Strengthening the Controlled Substances Prescription Monitoring Program,” entails a number of rules and regulations designed to reduce the harm of over-prescribing opioids relative to the abuse and misuse of such substances. This bill, signed into law by Governor LePage, mandates a number of changes for doctors and dentists who prescribe controlled substances in Maine. What changes will be implemented? First, this law imposes limitations on the medication dosage, as well as the duration of a prescription, that can be prescribed to a patient. According to Gordon Smith, JD, Executive Vice President of Maine Medical Association (MMA), the original bill limited opioid prescriptions to three days for acute pain and fifteen days for chronic pain. However, this legislation will now mandate a limit of seven days for acute pain and thirty days for chronic pain on opioid prescriptions. This law goes in to effect January 1, 2017. In terms of dosing, prescribers may not prescribe any combination of opioid medication in an aggregate amount of more than 100 Morphine Milligram Equivalents (MMEs) per day to new opioid patients (after July 29, 2016). Existing opioid patients with active prescriptions in excess of 100 MMEs per day are referred to as “Legacy Patients” and prescribers may not prescribe any combination of opioid medication in an aggregate amount of more than 300 MMEs per day from July 29, 2016 to July 1, 2017. Maine prescribers are required to query the Prescription Monitoring Program (PMP) database prior to prescribing opiates. Although this requirement has been in place since 2005, surveys indicate that only 7-20% of Maine prescribers currently utilize the state’s PMP. The purpose of checking this central state database is to identify patients who may be doctor shopping and minimize multiple controlled substance prescriptions for one patient. This aligns with the state’s hope of empowering healthcare providers to recognize potential substance abuse and treat patients accordingly. Via this statute, prescribers must complete three hours of continuing education every two years as a condition of prescribing opioid medications. This specific addiction training is only required if a prescriber wishes to continue prescribing opioids. All opioid prescriptions must be sent electronically as of July 1, 2017. What exceptions are part of this mandate? The MMA is currently seeking an exception for burn victims as well. Due to the supremacy clause of the U.S. Constitution, federal law takes priority over state law, therefore prescribers within the Department of Veterans Affairs (the VA) cannot be regulated by this type of legislation so long as the medication is dispensed at a VA pharmacy. Furthermore, dosage and duration limits would not apply to a prescription written for a veteran by a prescriber outside of the VA system if the prescription were filled in a VA pharmacy. How does this bill measure up? With this bill, Maine becomes the third state behind Minnesota and New York to require e-Prescribing and the second to require the electronic sending of a controlled substance after New York imposed a similar mandate in March of 2016. Since the implementation of New York’s mandate, total numbers of opioid analgesics prescribed fell by 78% within the first four months. Duration limitation goes into effect. All opioid prescriptions cannot exceed seven days for acute pain or thirty days for chronic pain. Lastly, as part of the state’s strategy, Maine has launched Dose of Reality, a website to help educate and inform their citizens of the dangers of painkillers and where to turn for help. It’s no surprise that technology should be considered a key player as we shift to value-based care. With smartphones, tablets and computers, health information is readily available for patients with a simple click of a button. Why should a consultation with a healthcare professional be any different? Telehealth greatly increases the scope of the healthcare industry and is bound to open huge opportunities in increasing the quality of healthcare. The ultimate goal here, is to prevent hospital readmissions through better management of individuals with chronic conditions, while also reducing associated costs. By enabling remote patient monitoring and remote access to clinicians, market growth is inevitable as awareness and implementation of standards for reimbursement and adoptions of these care models expands. While several reports claim that “technology gets in the way of the patient experience,” patients are in fact the ones demanding such access to care. This increase in patient demand for telehealth services has prompted many companies and healthcare organizations to think outside of the box and reevaluate the patient-centric model, while questioning what that care model really means to a patient. Well, it’s simple. Patients want a customized, cost-effective and convenient healthcare experience to which telehealth can provide. A recent report states that the global telehealth market was valued at $14.3 Billion in 2014 and is estimated to reach $36.3 Billion by 2020, growing at a CAGR of 14.30% from 2014 to 2020. As mentioned in a previous post, telehealth has the ability to bridge the gaps in care of behavioral health patients and providers. Not only does it provide a convenient, more comfortable and less expensive medical consultation, but it broadens accessibility to patients whom may not have many options when seeking a behavioral health provider, especially in rural areas. Unfortunately, the lack of psychiatrists and addiction specialists across the nation, as well as the stigma often involved, are contributing to the mental health and addiction issues and creating barriers to appropriate care. Patients will see their primary care physician and may not receive the exact treatment plan that they need; after all, primary care physicians do not specialize in behavioral health or addiction and often, these illnesses require a lot of time and patience to which the physician may not be able to accommodate. Telehealth will be able to connect patients in need with specialists regardless of their location who know how to treat these specific health issues. This effective care model will not only lessen the hit on the nation’s bottom line as more and more individuals grapple with suicide, addiction, and other mental health issues, but also revolutionize the way people view the stigma involved and encourage patients to seek help as they are able to receive treatment from the comfort of their own home. Geriatric patients stand to benefit tremendously as a digital health consumer. As mobility can be especially difficult for these patients, the ability to see a physician remotely removes one of the largest barriers to care. Furthermore, transporting patients of this age may potentially do more harm than good. With telemedicine, providers can more quickly spot at-risk patients and provide interventions to avoid an otherwise unnecessary hospital admission. Similarly, nursing homes can partner with health systems to provide bedside care for their residents at a fraction of the price of an onsite physician. These infrastructure synergies provide connectivity with electronic health records (EHRs) and create clear communication among hospitals, senior care facilities, referring physicians and patient families. They also provide the link to population based management databases and other health care analytic functions to measure value. Many surgical departments find telehealth to be a more convenient and cost-effective way for pre- and post- operative instructions for procedures of all magnitudes including wisdom teeth extraction, colonoscopies, stent placement and more. With in-person visits and paper instructions, patients may misinterpret or even forget important information relative to their surgery. This includes what medications to stop taking and how to physically prepare for surgery, while providing a clear, direct line of answers for any questions a patient may have. With instructions digitally delivered prior to surgery, telehealth reduces patient no shows and saves valuable scheduled operating room time. For post-op patients, providers can check the patient visually, ensuring that patients are following their treatment plans and making adjustments as needed. Through this continuous connection, providers are empowered to deliver the guidance that many patients need as they go through the healing process. These virtual check-ins ensure the patient is on the road to recovery, thus reducing readmission rates all without the patient ever having to leave their home. Furthermore, telehealth can improve treatment and medication compliance, specifically with controlled substances, i.e. pain medication. Opioid addiction often begins at the hands of a prescriber and with the nation currently facing an opioid epidemic, marrying technology and follow-up appointments when prescribing these types of medications serves as the optimal solution for the safety of all involved. 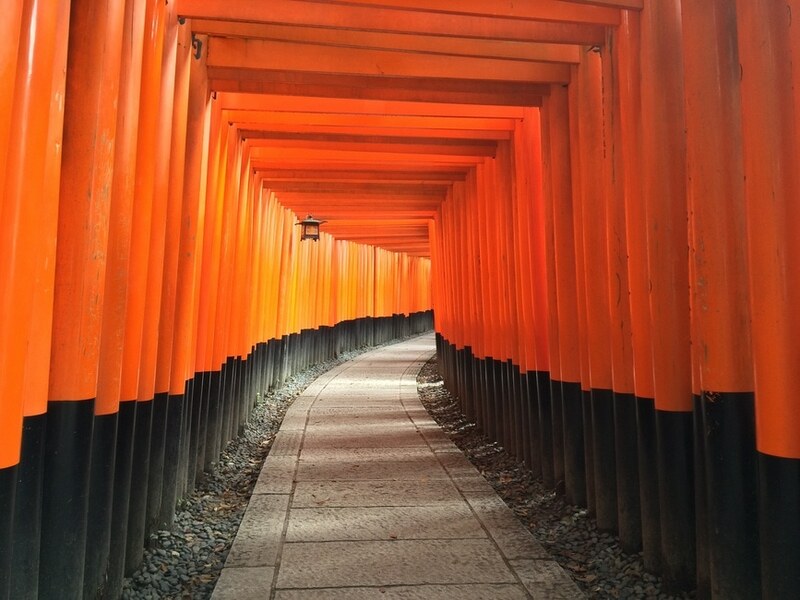 Technology should no longer be viewed as a barrier to care, but rather embraced in order to improve the healthcare industry, including the improvement of interoperability as well as patient outcomes. Telehealth not only meets the ever increasing demands of patients, but it also assists in preventative care by creating greater access to such care, thus reducing down-the-road costs and burdensome associated with chronic disease. With many chronic diseases being completely preventable, the prevent vs. treat mantra should be sound in every healthcare professional’s mind, while realizing that telehealth is a seamless way of delivering healthcare for all involved. There may currently be barriers in place regarding reimbursement from payers, but that’s sure to change as more and more payers jump on board for this new delivery model. After all, who’s to say telehealth won’t become the norm and be known as simply….health?